Delirium (or ‘acute confusion’) is a severe acute medical condition characterised by fluctuating disturbances in attention, arousal and cognition. It’s particularly common in ICUs, where it affects at least 40% of patients. Delirium is associated with increased mortality, extended length of hospital stay and long-term functional impairment in older adults. It complicates medical care and is a highly distressing experience for patients and their families. Despite NICE guidelines and Quality Standards there remains considerable variation among healthcare practitioners and settings in how delirium is detected and assessed. As a result this potentially preventable condition frequently goes undiagnosed. As part of their efforts to improve delirium detection, Professor Alasdair MacLullich at the University of Edinburgh and colleagues across the UK are inviting UK-based doctors, nurses, occupational therapists and physiotherapists who come into contact with delirium as part of their daily routine to participate in an online survey. The questions focus on the perceptions and practices of healthcare practitioners in how delirium is detected and assessed. All relevant practitioners are welcome to participate regardless of their level of knowledge of delirium. Professor MacLullich told us “Greater knowledge of the variations and patterns that exist among health practitioners is essential in identifying factors that contribute to the under-detection of delirium”. He and his colleagues intend to use this information to develop effective screening tools and implementation strategies that have maximal impact upon clinical practice and delirium detection rates. Delirium is a major concern for patients and relatives so ICUsteps would urge you to contribute your experience to this research and complete the online survey. These words were written by the daughter of a critically ill patient in his ICU diary. As many patients will have little or no memory of their time in critical care, having a patient diary can help provide a framework to fill in missing time in their memory and help them understand what they, and their family, have been through. Diaries are placed beside the bed and close relatives, nurses and others write daily entries, including descriptions, developments and mile stones of the journey of critical illness. Later on in their recovery, the patient and their family can go through the diary to understand, what has happened. For further information, visit the ICU diary network website where you’ll find literature, examples and help to get started. The results of the James Lind Alliance intensive care research prioritisation project have now been published bringing the issues that matter most to intensive care patients and relatives under the spotlight for researchers. Twelve topics were prioritised and the top three intensive care research priorities were identified. These will now be the subject of a themed call for research proposals by the Intensive Care Foundation. How can patients who may benefit from intensive care be identified early and admitted to the ICU at the right time? How can patients and their families be best supported as they start living at home again (eg, health and social care services, ICU support groups, long-term follow-up)? What is the best way to identify patients with, or at risk of delirium or agitation – how should the immediate and long-term effects of delirium or agitation be monitored and managed? You can read the full list of research priorities online along with the background to the study or in the October edition of JICS. This summer, we sent out our new relative room posters to all UK intensive care units. The poster is designed to go in relative rooms to signpost readers to the help and support we can offer. If you haven’t received your copy, or would like additional copies, please get in touch or download the poster. Have you given discharge summaries to your patients? Join the conversation! As part of a research project led by Suzanne Bench of Kings College London, our Information Manager, Catherine White, helped put together a staff training pack about writing patient discharge summaries. These are a lay summary for the patient, written by critical care staff, explaining why they were in critical care and what treatments they had. The provision of individualised information for patients is important because we know that many patients can have little or no understanding of their time in critical care, and a discharge summary can be the first step in helping to understand what has happened to them. It’s a brief summary (less than a sheet of A4) and takes less than 15 minutes for staff to do. The training pack was launched in 2012 and provides a template and advice about how to write these summaries. The critical care patient discharge summary training pack is a free resource and has been downloaded by many visitors, but now we’d like to hear from you to learn how it’s being used, about the benefits, or any difficulties, you’ve found or if you decided not to provide these summaries, what prevented you. We need your input, so please join the discussion on our online community. Nursing researcher Sarah McGloin of Anglia Ruskin University has published her research into patient’s perception of the nursing contribution to the intensive care experience. This grounded theory research analysed the perceptions of twenty ex-intensive care patients to find the contribution intensive care nurses provided to their experience of critical care. Analysis of the data found overwhelmingly, the patients considered the nurses within the intensive care setting nurtured a sense of belonging to a critical care family among the patients. Through belonging to this critical care family, the patients felt the nurses placed them in the central position with their needs being the nurse’s main priority at all times. Patients also considered intensive care nurses provided interventions to support a return to good health whilst also providing them with a safe and secure environment. This was especially important as they felt the nurses provided them with safety and security at a time of extreme vulnerability. Another key finding was that the role of the nurse for the patient did not stop at the doors of the intensive care unit and extended much further as the patient rehabilitated and recovered from their critical illness. It became apparent a key problem for patients was the transition from the nursing care received in intensive care to that provided by the lower dependency ward settings. The next stage of the research is to explore how the patient’s perception of belonging to a critical care family so successfully nurtured by the intensive care nurses, influences the patient’s expectations and experience of the transition of care between intensive care and the ward. This will enable interventions to be developed to enhance this part of the patient’s journey through critical care and return to good health. For more information, read Sarah’s findings in greater depth. Over the past few years, public and patient involvement (PPI) has become more important to ensuring good quality research. This is true in any area of health research but especially in intensive care medicine where there are many unique aspects of being an ICU patient or relative. PPI can impact at all levels of the research process, from being on the steering board as an independent member, advising around issues of approaching patients and relatives to take part in the research, and ensuring that the material given to the public is readable for a lay person. Good PPI, and particularly that which is started from an early stage in the research process, really ensures that the research and outcomes are relevant and acceptable to patients. We are volunteers at ICUsteps, so our trustees have limited time and can’t help with all the research requests we get, but we do have a list of people who have expressed an interest in helping with research, so we can sometimes help with recruitment of former patients and relatives. For preliminary discussions about patient involvement, you just need to get in touch. 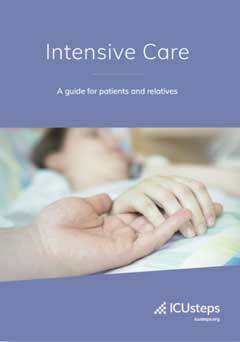 We launched our booklet ‘Intensive Care: a guide for patients and relatives’ in 2008. Although we knew there was a real need for good quality patient information, the uptake has exceeded our expectations. To date 116,000 copies have been ordered by UK hospitals and the booklet has now gone worldwide. We’ve been approached by professionals in other countries and have given permission for it to be adapted for use in Germany, Netherlands, Sweden, Denmark, New Zealand, USA and Colombia. We also have it translated into thirteen languages on our website.